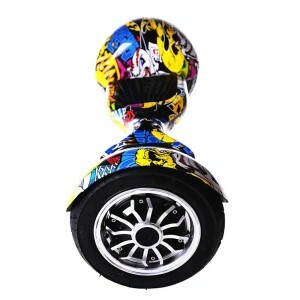 Here is a great new electric smart scooter / balancing board / skateboard with two driver motors within dual wheels of larger 10 inch size that is suitable for use by both adults and kids- people of any age with an effortless riding experience. 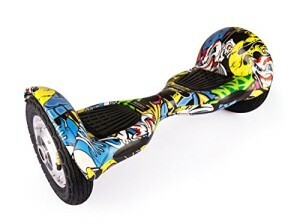 It is quite simple to learn for anyone even if they have never been on one of these boards as also the dual balancing system (with on-board processor with gyroscopic sensors and intelligent balancing chip) will keep you balanced- you may of course fall off a couple of times in the process and you should get the hang of it in under 5 minutes. It includes a bag which you can put it in and take wherever you go as it weighs 27.5 pounds- is portable enough and measures 26 x 10.6 x 4.33 inches so not very big in size (top plate is 4.33 inches and bottom plate is 1.18 inches) and can carry a maximum person weight of up to 287 pounds safely. 10 inch scooter can go for up to 15-20 miles on a single charge and the 36v, 4400mAh lithium ion battery can be charged in a couple of hours (battery has 1800 recharge times, 3.8 times life expectancy than regular lithium batteries, charger voltage is 100-240V 60hz and the charging should be done between -10 to 50 degrees Celsius). Maximum safe speed is specified as 7.5 miles per hour and you can easily use it as a mode of transport for going to school and office or back or for a fun outdoor activity in the park or on streets. Like the majority of other scooters on the market it can climb up to a 15 degree angle (maximum gradeability is 15 degrees) and with zero degrees of corner (minimum turning radius is zero) you can rotate, turn left or right, accelerate or do a smooth breaking. 10 inch tires are large and will help you go faster and get to your destination quicker and they are inflatable unlike a lot of the other models with 7 or 9 inch non-inflatable tires. When you’re first trying it out it is best if you put your feet closer to edge for better stability, use the wall if you need to, lean forward to go forward (accelerates by applying a little pressure with the front of your feet) and lean back to go back, one foot back and the other foot forward to do 360 degrees. It is quite a robust and durable scooter with stainless steel wheel frames, a long battery life and comes with a 12 month warranty in which period the spare parts are free but you just need to pay for return shipping fees. The scooter’s battery comes charged and the tires inflated and in the box you’ll find the Archetype electric scooter pad, the charger, the little remote control, a screwdriver and an instructions manual. You’ll see from the first time you go on it- is a lot of fun to use apart from making your life easier for getting from one place to the other.